Made from the bark of the Lokta bush, this handmade origami paper from Nepal provides stiffness and durability for any origami folding project. Each sheet features a solid green color on both the front and back of the paper. Lokta paper is crafted by hand using traditional paper making techniques in Nepal. 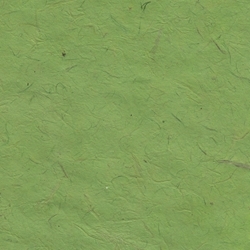 Made from the bark of the Lokta bush, the long fibers of this paper provides stiffness and durability for any project. Wet folding projects are especially suited for Nepalese Lokta Paper. Each sheet features a solid green color on both the front and back of the paper. Choose from 2 sizes: 6" or 9". The six-inch pack contains 12 sheets of paper while the 9" pack contains 6 sheets of paper. Because the paper is handmade, there may be a slight variance in weight/color from sheet to sheet.